Or An Inquiry Into The Origin Of Languages, Nations And Religions. First published 1863. This unique work shows that the Celtic Druids were Priests of Oriental colonies, who emigrated from India, and were the Introducers of the first of Cadmean System of Letters, and the Builders of Stonehenge, of Carnac, and other Cyclopean works in Asia and Europe. This title contains 4 maps and numerous lithographic plates of Druidical Monuments. The author was engaged in researches for this book nearly ten hours a day for twenty years. 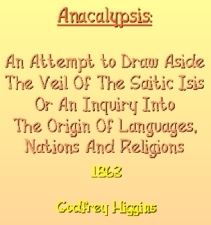 "Of the author's portentous knowledge, his powerful critical faculty, his fitness to investigate and elucidate the ancient mysteries of mythology, philology, ethnology, and other ologies, many persons speak with reverence and rapture. But even men of education must admit that Higgins collected a large number of curious and important facts. The novel independence of Higgins' mind may serve as an example to many readers; the vastness of his learning, the justness of his reasoning, and his critical sagacity, are beyond the ken of ordinary mortals." 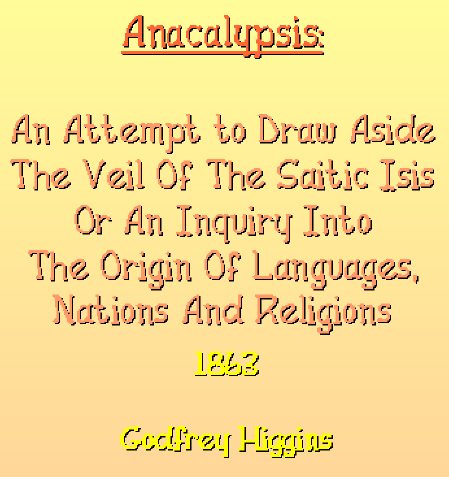 Godfrey Higgins was convinced that a high civilization had flourished prior to all historical records. He believed that there had existed then a most ancient and universal religion from which all later creeds and doctrines sprang." His research lasted over 20 years. "He attempted to establish the existence of a prehistoric universal religion and to trace its development into contemporary times. He believed this religion possessed accurate knowledge of universal and cosmic phenomena and held neither priesthood nor institution as intermediary in man's communion with the Divine." This highly sought after book is extremely rare. Two volumes. Partial Contents: Probable Origin of Numbers and Letters; Etymology and its Use; Origin of the Adoration of the Bull, Phallic and Vernal Festivals; Age of the World; First God of the Ancients, The Sun, Metempsychosis, Moral Evil, Buddha, Genesis; The Sun the first object of Adoration of all Nations; Two Ancient Ethiopias, Great Black Nation in Asia, Hindoos and Egyptians similar; Ancient Persians, First Books of Genesis, Disingenuous conduct in the Translators of the Bible, Abraham acknowledged more than one God; Jewish Trinity; Ancient Jewish Cabala, Sephiroths and Emanations; Melchizedek, Zoroaster, Zendavesta, All ancient Religions astrological; Character of the Old Testament; Orphic and Mithraitic Trinity, Mithra, Opinions of Herodotus, Porphyry, Strabo, Julian, Times of Pythagoras and Zoroaster, The Vedas describe the Persian Religion; The word OM; The Christian Trinity, Its Origin, Philo's Trinity of the Jews; Life of Cristna; Crucifixion of Cristna, Immaculate Conception, from the History of Pythagoras; Buddha the Sun in Taurus, as Cristna was the Sun in Aries, Names and Meaning of the word Buddha; Isaiah's Prophecy known to the Egyptians and the Celts of Gaul, Mystical meaning of the Letter M, Oriental Astronomical Systems; Cross the meaning of it, Monograms of Christ and Osiris, Lama of Tibet, Indra crucified, Jesuits' Account of Tibet; Hercules and Samson the same; Baal, Etymology of the world Bal; Yajna or Passover; Secret Doctrines, Bull-headed and Ram -headed Gods; Disputed Chapters of Matthew and Luke; Flood of Noah, Text of Genesis, Origin of the Delta of Egypt; Adoration of the Virgin and Child; Ionians, Argonauts, Linga and Yoni; The Lotus; The Loadstone, Helen Athena; Ship of Egypt and Greece; Aphrodite and Diana, Thales; Cassandra, Babylonian Mythos, Constantine and Helena, Astrology; Rome, Jewish Pentateuch; Judaism shown by Eusebius to be older than Abraham, Hellenism; Mount of Solomon, Mount of the Cabala, Mount Olympus; Religions of Afghans and Rajpouts; Arabians of India; Jews hate the Female Principle, Jews and Egyptians, Observations on the Jews; Origin of the Sanscrit; Amazons; Cyclopes, all Ancient History Fable or *nigma, Freemasons in Mundore; Serpent of Genesis; Observations on Homer, the Iliad, and the *neid; Fish Avatar, Fish Acrostic; Observations on Templars, Chair of St. Peter, Gospel of St. Joachim, Masons; Freemasons of York and India. In great numbers of places in the Old Testament, the allegory of trees and letters is referred to. What was the Rod of Aaron which threw out branches or leaves or buds ? What were the magical peeled rods of Jacob Wat has the meaning of the branch from which the stem of Jesse was to arise Was Jesse I-esa ? The Gnostics frequently called Jesus the tree of Life, and the tree itself which grew in the middle of Paradise, and, at other times, a branch. My idea that the fruit of the tree of knowledge was the acquisition of the knowledge of letters without initiation, is supported by the assertion of Enoch, that the wickedness of the world, which caused the flood, consisted in the attempts of men to obtain forbidden knowledge. It is also strengthened by a passage of Proverbs, Chap. iii, 13, 18, where Solomon says, "Happy is the man who findeth wisdom," - " She is a tree of life to them that lay hold upon here." I suppose certain of the leaf-names of figures of notation were selected by a society, as a secret system of syllabic writing, after the symbolic system had been long in general practice, and that this society being spread about in different countries, slight differences in the mode of selecting the sixteen letters took place. Thus the religious mythos was not every where described in exactly the same manner ; hence we see the small variation which shews itself between the Hebrew and the Greek.